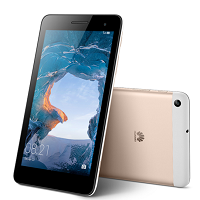 The Huawei Mediapad T1 7.0 has the basics covered. It has a 7 inch screen for videos and pictures. A 1.2 GHz processor powers the device. It has two 2MP cameras on the front and the back. Also, the battery on the Huawei Mediapad T1 7.0 at 4,100 mAh can last a while.